The following is a partial resume of the MSU Cryogenic Initiative’s staff. 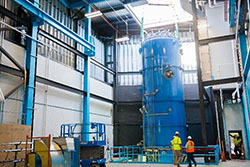 It focuses on the staff’s involvement in large helium systems in the United States. This development reduced the electric input power from 6.5 to 4.2 megawatts for (4 GeV operations) using the patented Floating Pressure Process, resulting in a savings of $92,000 per month in electric costs at $0.055 per kilowatt-hour. 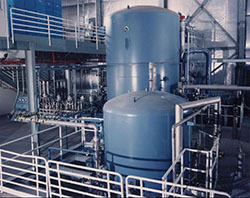 The Floating Pressure Process (Ganni Cycle) was developed at the Superconducting Supercollider Laboratory (SSCL) by Dr. Rao Ganni. 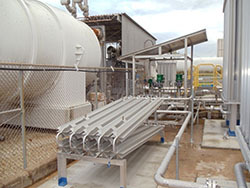 This development reduced the electric input power from 3.9 to 2.7 megawatts and in liquid nitrogen consumption from 210 to 160 gallons per hour using the patented Floating Pressure Process. 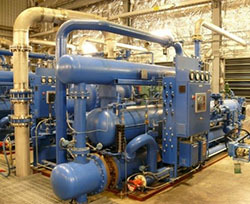 It resulted in a savings of $46,000 per month in electric costs at $0.055 per kilowatt-hour and of $12,000 per month in liquid nitrogen at $0.25 per gallon. This development reduced the electric input power from 9.2 to 5.0 megawatts by implementing modifications and the Floating Pressure Process. It resulted in a savings of $215,000 per month at $0.070 per kilowatt-hour. No shield refrigerator in existence to date has the load-capacity range, turn-down range, and load-temperature stability, all handled automatically. It is capable of automatically supporting a load range from 118 kilowatts at 100 Kelvin down to 11.2 kilowatts at 15 Kelvin. It has an essentially constant efficiency from 100 percent down to approximately 30 percent of the maximum capacity, which is handled automatically and provides a temperature stability of less than ± (plus or minus) 0.1 Kelvin. It requires less than 66 watts of input power per watt of cooling at 20 Kelvin (i.e., the design load temperature) and at peak operation (20.4 kilowatts), and has an increase of less than 20 percent in input power (for the same load) at 31 percent of the peak load. 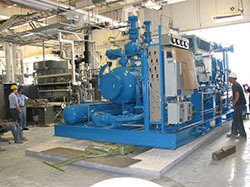 This development resulted in an essentially constant performance and with automatic control for a wide range of load types from 100 percent down to approximately 30 percent of the maximum capacity, requiring less than 230 Watts of input power per Watt of cooling at 4.5 Kelvin at the peak cold compressor load. 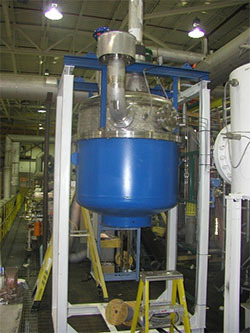 It also demonstrated the ability to handle a pulsed load in an efficient and stable manner (even though it is “not designed” for this type of load). 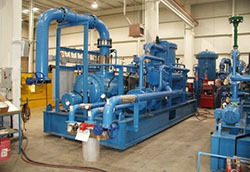 It can automatically operate from a peak load at 19.5 bar discharge pressure down to 6.5 bar (discharge pressure) without throttling (imposed pressure reduction across a valve) or bypassing flow or adding a "dummy" heat load. This project is expected to have the same performance as JLab’s 12 GeV (gigaelectronvolt) upgrade 4.5 Kelvin refrigerator (described above).